Wow, we never thought we would say this, but reaching the end of today is a bittersweet moment. On one hand, we’re glad we have the worst behind us, on the other, nothing will surpass what we saw today for beauty. You could say the day didn’t start well – less than 3 metres down the road and we had two sublimely graceless dismounts. Tim and Edd clearly still haven’t got the hang of balancing. The second bit of bad news – a friendly local, no doubt with our best interests at heart, informed us that ALL the mountain passes were still closed. Ah, right. Not be done out of a trip up and over a mountain, we carried on to see how far we could get. We’d come this far after all! We therefore identified the most open of the high Alpine passes available to us and decided to go as far as we could. Cue a VERY long ascent. But by hook or by crook, the loss of gallons of sweat, the deep burn in the thighs, random singing/talking to ourselves and the prospect of the top, we made it to the summit. However, the descent down to our destination, on the other side of the pass remained under many feet of snow. Whilst it was sad for us to be unable to go down the other side, we went to our slightly longer and harder Plan B – cycle all the way back the way we came, a hairy descent, with an additional 1,400ft climb and get a train through the mountains, via the Gotthard Tunnel (which cyclists are not allowed to use) and to where we sit right now, with a cold beerski in each our hands. To be clear, as a result of the fact that the passes were closed, we had to climb a lot further than planned! A year ago we struggled up a flight of stairs, which makes today’s achievement all the more remarkable. And, most importantly, we are one step closer to Varese. 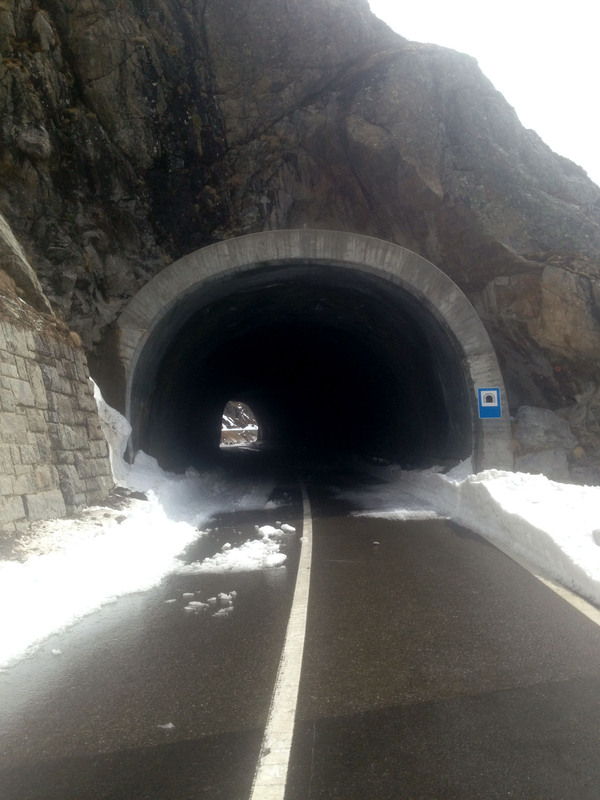 Alas, there is a lot of snow in the Alps this year, I forgot to tell you (but Swiss keep very clean their roads). Interesting your new metric proposal: my favourite is “long bratwurst”.